Jacques has lost both his parents at a young age. When his mother died his father made arrangements for Jacques in case something would happen to him. Jacques is French, but speaks English fluently and this is something he needs for his future. His father appointed a guardian, Oliver, who lives in England and Jacques is being forced to leave everything and everyone he loves behind to start over in a different country. Oliver is a selfish and arrogant man. He's married to Anna, who's a bit kinder, but distant. They already have a son and a daughter, so Jacques isn't the only child in their home. Oliver doesn't care about any of them and Jacques has to go from a warm home to a cold one. 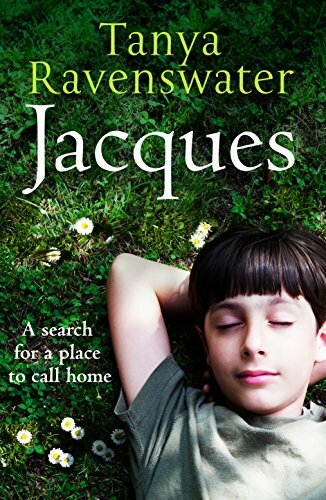 Jacques is a beautiful story about a boy who doesn't have a lucky start in life. Jacques is kindhearted and strong. Even though he's grieving he makes the best of his situation. He's an admirable person and I loved reading about him. He manages to adjust because he has to and his good-naturedness is wonderful. Jacques slowly comes to appreaciate his new life and surroundings. He easily makes friends, he feels at home with Anna and Rebecca and he keeps following his heart. Jacques is an incredible person and that is what makes this book so amazing. Jacques is an impressive coming-of-age novel. Tanya Ravenswater writes in an open and disarming way. This is a terrific contrast to the formal dialogue she uses. Main characters are addressing each other by their full first name whenever they speak and they are always incredibly polite, which perfectly suits the environment Jacques is being brought up in. It's definitely something that stands out and that makes his story memorable. Even in England tragedy follows Jacques, Tanya Ravenswater doesn't spare him. He has to get used to grief, but this also makes him learn to welcome every good thing that happens in his life. Jacques expresses his emotions through his talents. Dealing with many different kinds of suffering makes him wise beyond his years. This striking quality is apparent in every conversation he has and I enjoyed that a lot. Tanya Ravenswater has writte a terrific complete novel. Jacques is a riveting story about a very special person. This sounds like a wonderful book. I love coming-of-age novels, and this one sounds like it is written very well. Definitely going on my TBR list. Thank you for a great review! This quote from the book is so beautiful & deeply emotive: 'It is only when we matter, when we are seen and truly loved, that we know what it means to fully live'. This book sounds like something I'd really enjoy reading, thank you for the review! Sounds a bit tear-inducing, though I'm sure it's well-done! Aw! This sounds like a really good one to pull at my heart-strings. Great job on your review, by the way! I really enjoyed it. It looks as though some wonderful characters have been created and cast in this novel. I imagine that to read about Jacques, as well as his journey and inter/personal development, would be wonderful.